Your favorite little yellow creatures are back and funnier than ever! 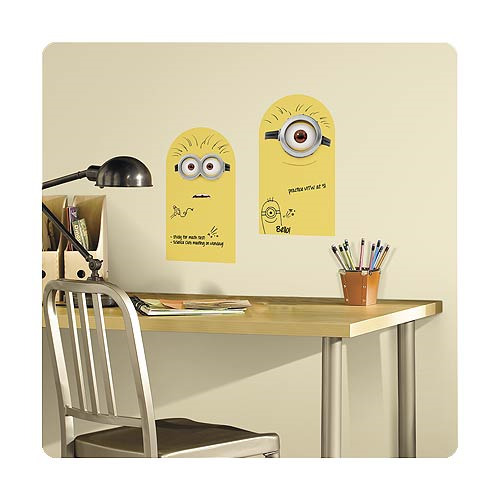 Featuring minions Kevin and Stuart, fans of all ages will love decorating with these fun Despicable Me Minion Dry Erase Peel and Stick Wall Decals. Add them to a dorm room, bedroom or even an office for the adult minion lovers! Keep track of daily task, reminders, and notes in style with these awesome wall decals. Also, they're removable and repositionable making them a must have for any room of your choice! Includes two decals, each measuring 16 3/4-inches tall x 9 1/4-inches wide.